Superheroes, etc. : Kill, superhero! Kill! It's only been in the last few months that I've returned to reading superhero single issues as they're released, and my tastes proved shamefully one-sided. I dipped my toes into the new 52 and found very little to my taste, while I've been more impressed than I could have imagined with Marvel NOW! One thing I'm not happy with is how the notion of superheroes killing criminals has clearly become more acceptable over the years particularly, it seems, in Marvel. Now the example pictured above is a special case and, in fact, isn't entirely what I'm talking about. That's Doc Ock in Spider-Man's body about to blow away the amoral villain Massacre in Superior Spider-Man #5 (and I'm enjoying that title way more than I thought I would when I first learned of the concept). Ock/Spidey killing someone isn't particularly surprising, but what I found interesting was part of the fallout in Superior Spider-Man #6. It wasn't all that long ago that it wouldn't have even been a question whether or not a superhero who killed someone would stay in the Avengers. An Avenger who had killed would, at the very least, be subjected to a court-martial-type deal overseen by his/her teammates. 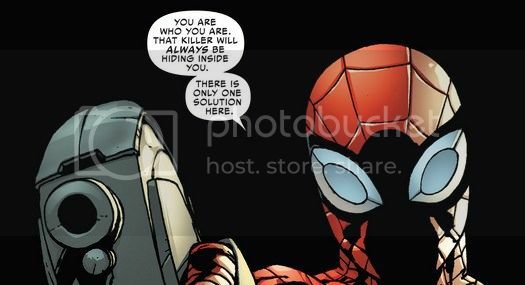 In the case of Ock/Spidey here, who shot a man after he had already been defeated and could have easily been restrained? He wouldn't stand a chance. For my most recent Extra Medium column over at Popdose, I wrote "The Top 10 Worst and Best Things About The Avengers" (I really do need to get another one out). Under "worst" I talked about how I didn't like seeing the superheroes in the flick killing people. Of course, they're justified. They're fighting a war and for most of the movie, they're on the losing side. Or at least the side with the biggest disadvantages. What bothers me more is that there's killing without any discussion of killing. It's casual. When I was younger if a superhero killed someone, or even seriously considered killing someone, it would consume them. It would impact them for years. 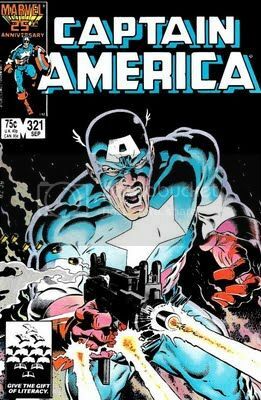 When Captain America shot and killed a terrorist during Mark Gruenwald's classic run, it was one of the many events that ultimately led to Steve Rogers being temporarily stripped of his title, costume, and shield by the US government. More importantly, it was a kidney shot to Cap's soul. Now, it doesn't seem to bother anyone much. Sometimes it's even just something mentioned in passing. Hawkeye pierces a few throats while rescuing Spider-Man in Age of Ultron #1. In a scene meant to be - at least in part - humorous, Maria Hill shows a man photos of the Hulk ripping a skrull in half in Indesructible Hulk #3. Shanna the She-Devil accidentally kills a Savage Lands tribesman who was attempting to peacefully communicate in Savage Wolverine #3, the scene is treated like slapstick, and when the justifiably enraged tribal warriors attack Shanna and Wolverine, they have no problem using more lethal force in retaliation. I don't want to start a debate. I think the ship sailed a long time ago unfortunately. But I do want to say two things. First, ultimately, life is what is of primary concern to the superhero. That's why the term "crime-fighter" has always been incomplete. Bruce Wayne doesn't become Batman because Joe Chill broke his mother's necklace. Peter Parker doesn't become Spider-Man because that crook he let walk got away with too much dough. Superman doesn't dole out parking tickets and Dardevil doesn't give a crap out used car salesmen unless they start killing people. Superheroes care about life, plain and simple. They don't just face death. They wrestle it. And I think to allow characters whose primary enemy is death itself to dole it out is a betrayal of the very concept of the superhero. 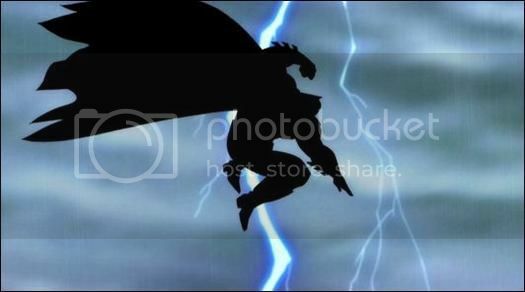 Second, earlier this evening I watched part 2 of the animated adaptation of Batman: The Dark Knight Returns, and it was this that inspired this post. See, what impressed me the most about the adaptation of DKR is the raw power of the source material. The story is almost 30 years old, and along with Watchmen it's suffered many copycats over the years. In spite of all the dark, violent, and edgy superhero comics that came out between the release of the original DKR series decades ago and its more recent adaptation, it remains absolutely goddamn brutal. You will wince when you watch scenes like Batman's bone crushing battles with the Mutant Leader, or his final dance with the Joker. Yet, in spite of how brutal it is, in spite of how dark and violent, in spite of how its originality and innovation radically changed the landscape of superhero comics; in one of the first scenes of Batman: The Dark Knight Returns, Part 2 Batman saves a liquor store owner from a bunch of thugs and when he sees the shop owner about to kill one of the thugs, he turns on him and says, "Pull that trigger, and I'll be back for you." So if you're going to tell me that superheroes need to kill in order to be believable, interesting, or modern, save your breath. Because DKR gave us a superhero darker, edgier, a million times more brutal, and certainly more interesting than anything that ever went in or out of Avengers tower, and even he wouldn't cross that line. Haven't read the issue, but how can the Avengers say all those things when they have Wolverine sitting there, completely welcome? Normally, I would say something like this was an exaggeration, but I think it's fair to say that Wolverine's membership in the Avengers did a lot of damage in regards to Marvel's superheroes' views towards killing. The Avengers was always a no-kill zone. Bringing Wolverine into the mix has to change that. It has to. Even if Wolverine doesn't kill anyone while he's with the Avengers, he's going to kill people when he's out on his own. Which means killing has to become more acceptable to the Avengers. And if it's more acceptable to Marvel's premiere team, who else is going to go against that? Nice commentary, and long overdue. I too noticed this in some of the Avengers trades I've been reading, the storyline particularly involving fighting (and often needlessly) dispatching Skrull soldiers. This reminds me of something that Steve Ditko said in the hard-to-find 1987 VHS documentary, Masters of Comic Book Art. Introduced by Harlan Ellison, the doc features interviews with Frank Miller, Will Eisner, Jack Kirby, Harvey Kurtzman, Berni Wrightson, Neal Adams, Moebius, David Sim and Art Spiegelman. And it's brilliant- each creator talks for about 10 minutes about their craft. Anyhow, the doc includes an interview (audio only!) with the elusive Steve Ditko. Ditko expresses his views on the new amoral heroes who kill and who have become interchangeable with the villains they fight. Of course, Ditko is espousing his views of Objectivism but, in the end, he has a helluva' a good point. The point being - why should heroes be so eager to kill anyone?